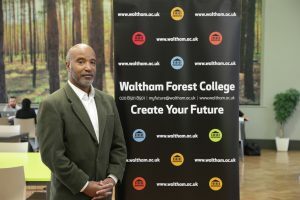 Paul Butler is Chair of Governors at Waltham Forest College. In February 2018 Ofsted judged the College to be ‘Good’ in all that it does, describing it as an ‘inclusive college’. Paul shares his extensive experience of FE governance, talking about the challenges he has faced and how he has overcome them, the role of a governing board, and the skills and attributes governors require to be effective. Why did you first decide to join the board of a college? I joined initially at the point of incorporation because as part of my responsibility, I was funding the college. As part of that responsibility, I had to then become a member of the board. I’ve continued because most of my work has been around community engagement, helping young people or adults fulfil their aspirations. Can you sum up Waltham Forest College and the role it plays in its local community? The college provides a range of vocational programmes and we are incredibly proud to have achieved our first grade two (Good) Ofsted rating this year. We serve a diverse community and have high percentages of learners with English as a second language and on ESOL courses. We also have significant numbers who didn’t fare well at school, for whom we’re providing a second opportunity based on real careers and job opportunities in a vocational area that they are passionate about. When I joined we were going through a dramatic period of change and the time commitment was very heavy, but now I’m probably spending half a day a week on the role. I chair the board, sit on two sub committees, and I have one corporation meeting a month. I also have briefing sessions with the clerk and principal and engage with other board members. In the last six months we have appointed a new chief executive, so I am in more in contact than I would usually be. I may email at the start of the week and then again at the end, as well as having an informal conversation midweek. I keep a clear distinction between my role in terms of governance and chairing the board, compared to the operational responsibility of the chief executive, principal and leadership team. How has the governing board contributed to the success of the college? The board has helped the college develop and we have a clear strategic direction with priorities, appointing senior post holders and holding them to account, as well as stability around our finances. What do you look for in governors? Firstly, I look for a genuine and proven commitment to the local community we serve. A financial background is useful, and legal and HR backgrounds can be too. Another useful area is around teaching, learning and quality. There are also specific areas for individual institutions. If you are developing specific sectors, for example special needs provision, you may want someone with senior management experience in that area. But it isn’t possible to represent all vocational areas on the board, so we have chosen to address that with advisory groups linked to curriculum areas. We need board members who can analyse information and act for the college at meetings. People also need time; they need to turn up at meetings, having read the papers. They must also be passionate about further education. That’s non-negotiable. What I don’t want, is people who have been in senior roles and see their role as running the college – that is not their responsibility. What were the main skills, experience and knowledge that have helped you in this role? Being chair of several organisations and sitting on numerous boards over the last 27 years has been helpful. My professional networks have also helped significantly. I haven’t had the answer to every single issue that has arisen, but I’ve been able to discuss them with colleagues in various sectors. You never know when you’ll need those networks, but it is important to nurture them. Knowing the college and the community it serves well has also been important, because it means I have an understanding of the journey students are on; for example, of what it is to be a black young man in London. How have college growth and improvement impacted on the local community? If a college is doing well, students speak to each other and get others in through word-of-mouth recommendation, so it is no surprise we have seen growth in learner numbers. That’s a result of improving quality and getting public recognition of that with the Ofsted rating. We are in London and can’t ignore what’s happening in communities with gun and knife crime, but we have an excellent record on that front and the college feels like a safe environment to be in, which also helps. What do you find most rewarding about being on the board? The most rewarding aspect of my involvement is seeing students’ achievements recognised. Going into a classroom and seeing a principal presenting certificates for improved attendance, when you know that a student has overcome challenging issues in their private life, for instance, is very rewarding. Graduation ceremonies are also very special. Ultimately, it all boils down to what your learners achieve. How would you appeal to other professionals – including those from a black, Asian and minority ethnic (BAME) background – to join boards? Colleges need to be clear about what they are looking for. If you want to increase the representation of the BAME community, you need to be clear why. If the only reason for getting Paul Butler on the governing body is because “he is a member of the African, Caribbean community”, then you wouldn’t have got me. However, if you feel that I have experience relevant to the work of the governing body, and the icing on the cake is that it is with a community you are trying to work with, then we have something to talk about. If your only hook is race, it’s not going to work. The experience has helped me to develop my own skills in so many ways. I have been exposed to a range of areas around corporate governance and, with a wealth of experience around the table, there are always opportunities to learn new things and develop yourself. The structured training and support provided by the ETF and the Association of Colleges has also been really good.